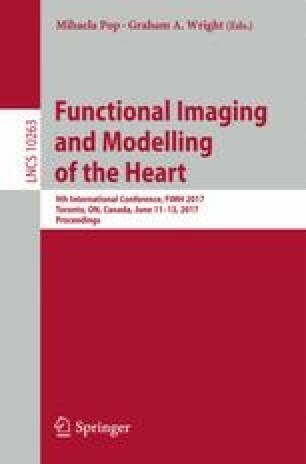 To analyze left atrial remodeling may reveal shape features related to post-ablation outcome in atrial fibrillation, which helps in identifying suitable candidates before ablation. In this article, we propose an application of diffeomorphometry and partial least squares regression to address this problem. We computed a template of left atrial shape in control group and then encoded the shapes in atrial fibrillation with a large set of parameters representing their diffeomorphic deformation. We applied a two-step partial least squares regression. The first step eliminates the influence of atrial volume in shape parameters. The second step links deformations directly to post-ablation recurrence and derives a few principle modes of deformation, which are unrelated to volume change but are involved in post-ablation recurrence. These modes contain information on ablation success due to shape differences, resulting from remodeling or influencing ablation procedure. Some details are consistent with the most complex area of ablation in clinical practice. Finally, we compared our method against the left atrial volume index by quantifying the risk of post-ablation recurrence within six months. Our results show that we get better prediction capabilities (area under receiver operating characteristic curves \(AUC = 0.73\)) than left atrial dilation (\(AUC = 0.47\)), which outperforms the current state of the art. Part of the research was funded by the Agence Nationale de la Recherche (ANR)/ERA CoSysMed SysAFib and ANR MIGAT projects. The authors would like to thank Alan Garny, Côme Le Breton and Marco Lorenzi for their great support.